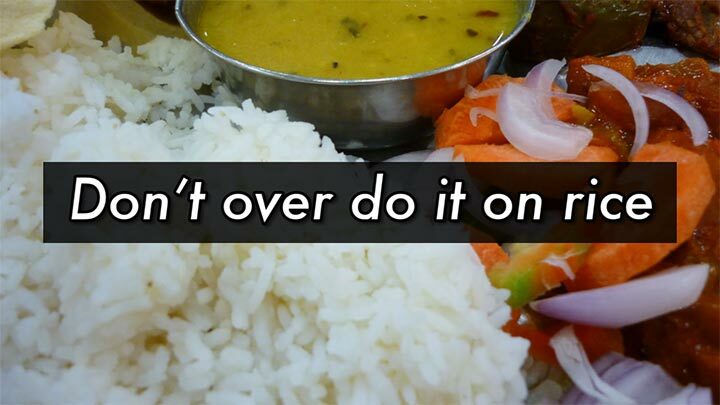 Unfortunately, Indian foods tend to get a bad rep of being unhealthy. This impression about Indian foods exist is because most restaurants and takeaways tend to serve us with huge portions of greasy, fattening and calorie-dense meals. What makes a food healthy or unhealthy really comes down to the preparation, cooking methods, ingredients used and portion size. 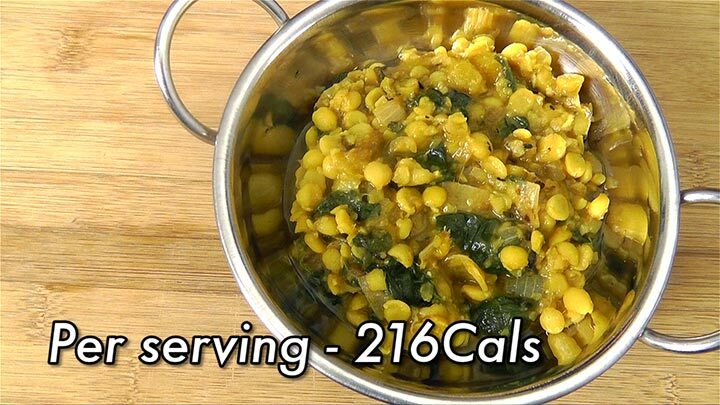 You CAN enjoy healthy Indian food without sacrificing the flavours. The best way to flavor your food without adding many calories, is to use herbs and spices. 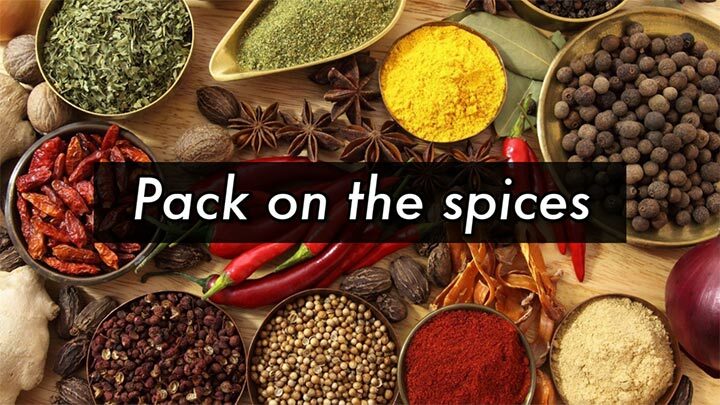 So be sure to use a huge variety of spices. 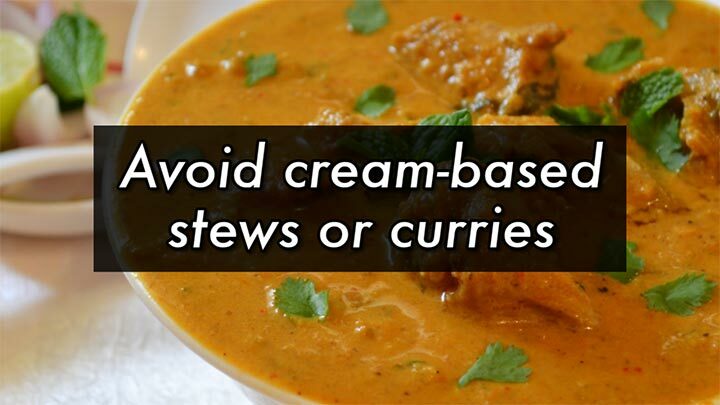 Indian curries are well known for their creaminess and oiliness. Use a non-stick pan and reduce the amount of oil used. 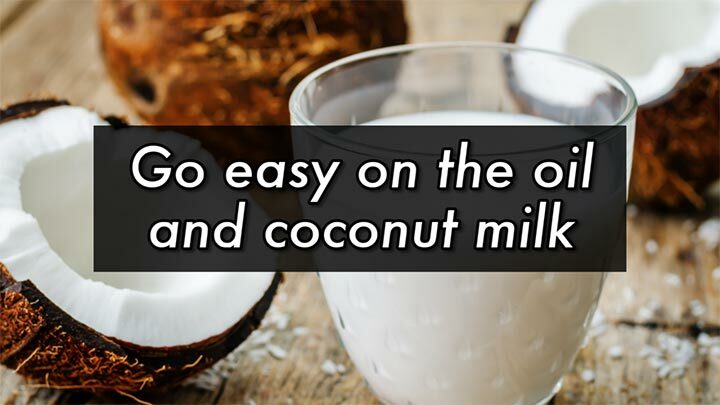 Yes, coconut milk is healthy and flavourful, however its high fat content can easily rack up lots of calories. 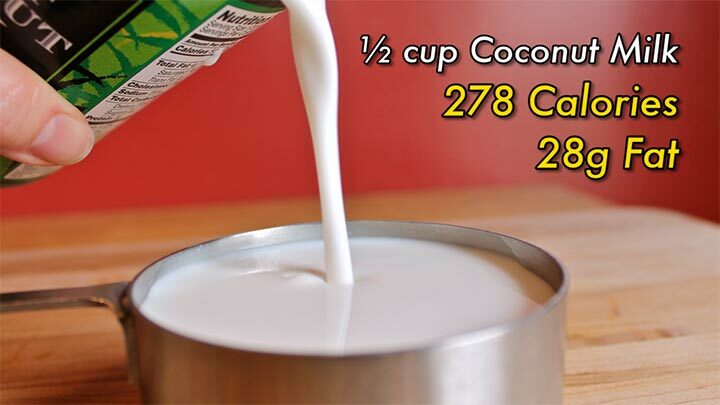 Just ½ cup of coconut milk has 276 Calories and 28g of Fat. So reduce the amount used. Swap it with yoghurt instead and go for tomato-based curries. Avoid deep fried food such as samosa, pakora, onion bhaji, vada and even chicken. 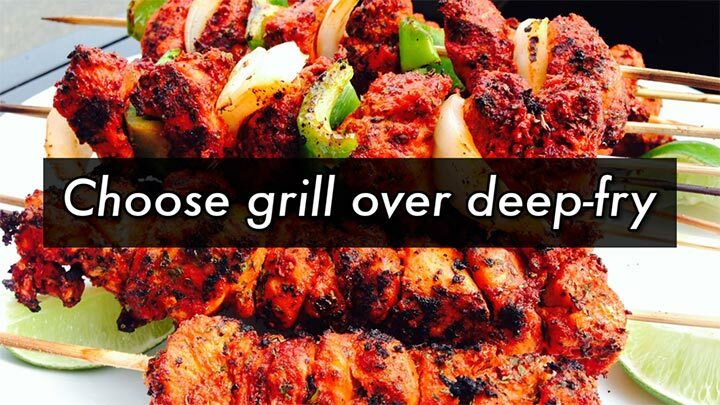 Choose anything tandoori instead, which is essentially grilled food. 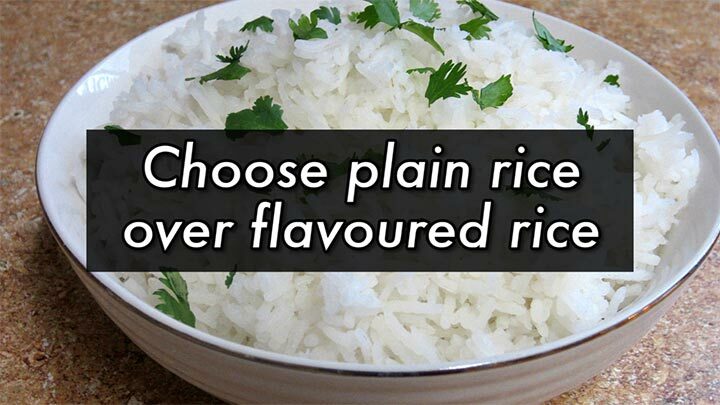 Most flavoured rice such as biryani rice is loaded with oil or ghee. 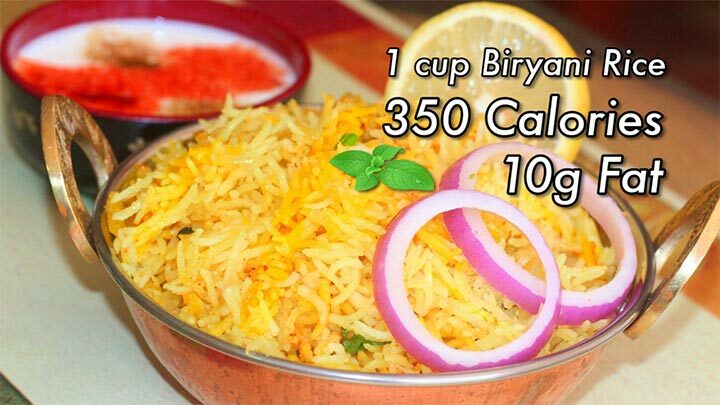 1 cup of cooked biryani rice has an average of 350Cals and 10g of fat, whereas 1 cup of plain basmati rice has under 200calories. I’m sure we all know some one who would pile on huge amount of rice and basically that’s the centre of their meal. 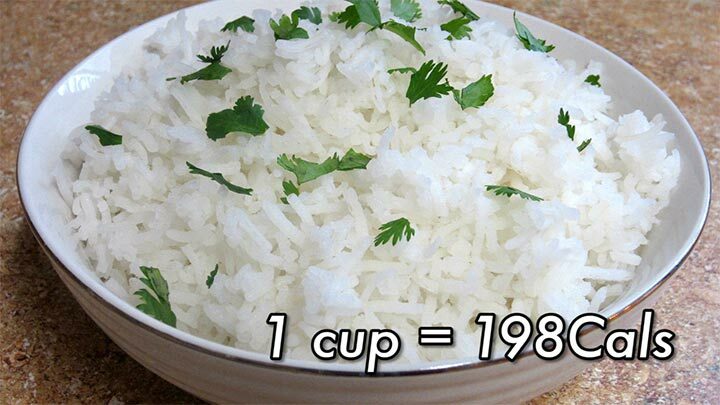 Remember that rice should only make up quarter of your meal. A naan goes perfectly with curry. 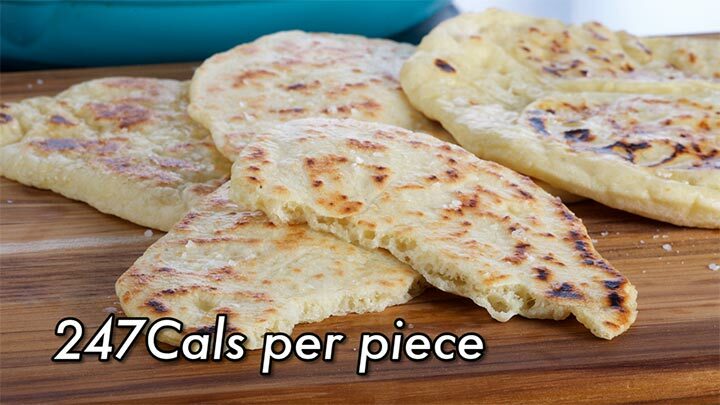 But be aware that 1 piece of plain naan has an average of 247 calories. Butter or cheese naan can sometimes rack up to 400 Calories. 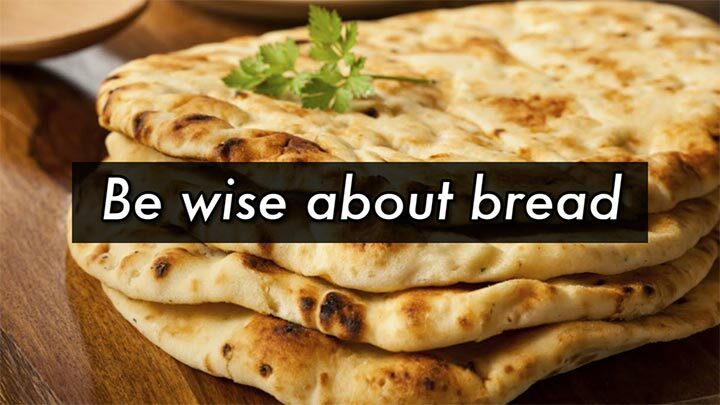 Avoid naan or paratha. 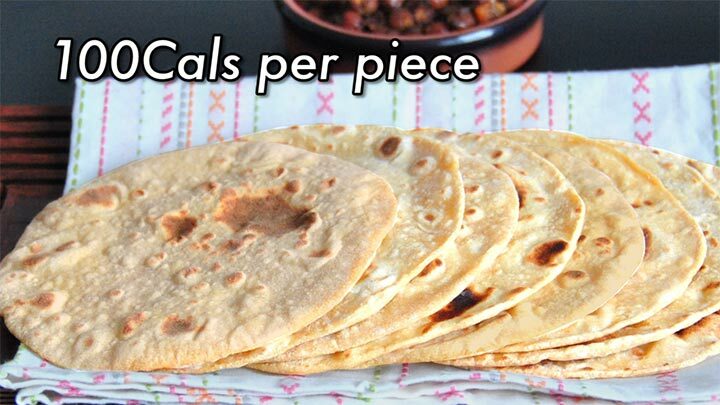 For a lighter option, opt for chapatti instead which stands at 100 calories per piece and very low in fat. So follow these tips and you can enjoy Indian food as part of a healthy and balanced diet. I want to share with you some of my favourite Indian dishes that you can have for breakfast, lunch and dinner. To be honest, it can be quite intimidating to cook Indian food because of the huge varieties of spices used and it can take quite a long time to prepare a dish. So what I’m going to share with you is my take on some of my favourite dishes. 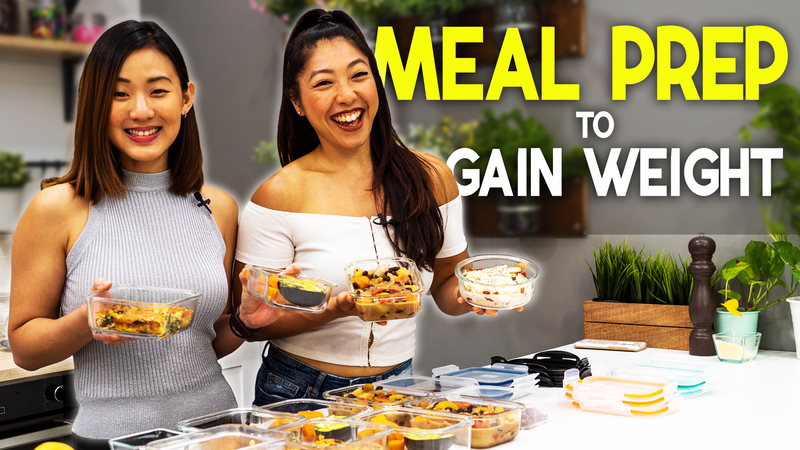 I’ve recreated them to make them healthier and you can prepare these dishes in under 30 minutes. So it’s easy, quick and convenient. For breakfast, I love steamed idli. Instead of the traditional method, we want to add oats and also vegetables into the mixture, to make it a really filling breakfast. 1) In a large bowl, add oats, rava and salt. Mix well. 2) Add in the yoghurt and mix until well combined. Set aside. 3) Heat oil over medium-high heat. Add mustard seeds, cashew nuts, green chillies and curry leaves. Saute very quickly until they begin to pop. 4) Then add in the grated carrots and continue to sauté for another 1 – 2 minutes. Remove from heat. 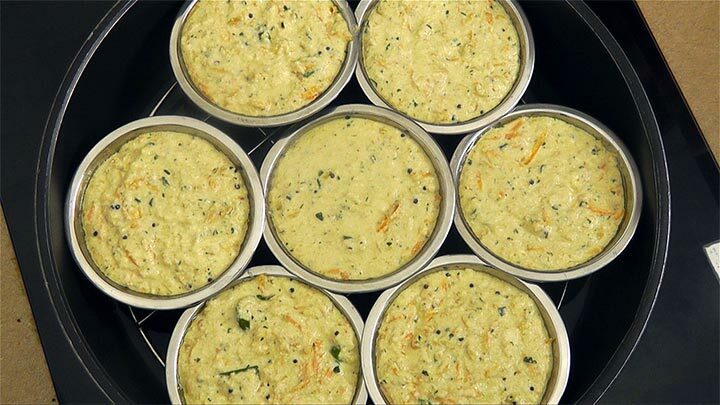 5) Add the cooked mixture and ½ cup of water into the oats-rava batter. Combine well. 6) Grease idli plates or if you don’t have it, use 8 small stainless steal cups, just like what I have here. 7) Right before steaming, mix in the baking soda. 8) Then scoop the batter equally into the cups. 9) Steam for 12 – 15 minutes and Serve warm. 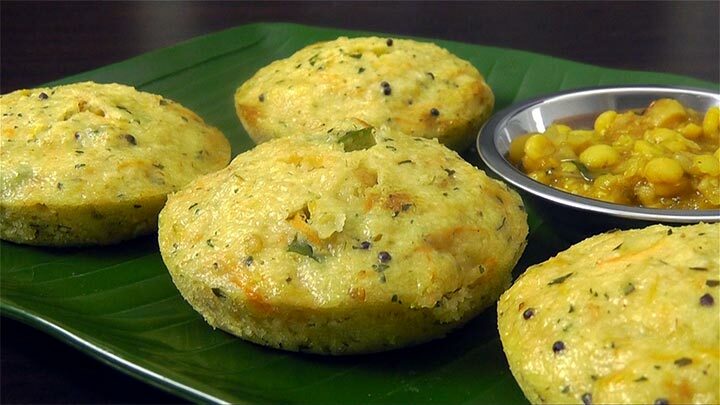 Have two idlis for breakfast together with a light chutney or dal. They are fluffy, light yet very filling at the same time. Rava is made from durum wheat, which has a higher protein content and is digested slowly. Oats on the other hand, is high in fiber. So the combination of rava, oats and carrots will keep you full for longer and prevent overeating. 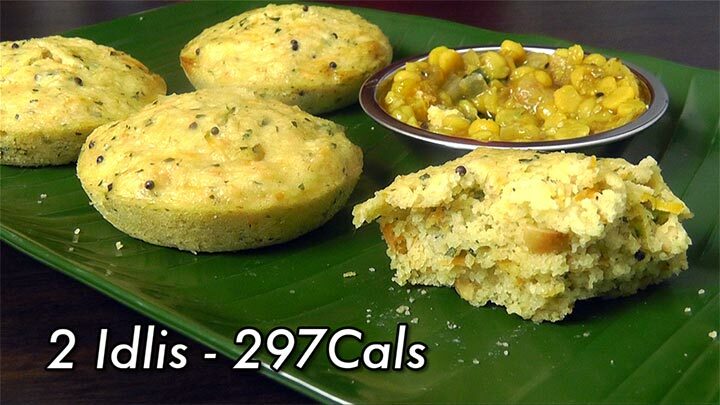 These idlis are high in carbs and protein but low in fat. So they are also great as a pre workout snack to boost you energy and performance level. 1) In a pot, add 2 cups of water, lentils, turmeric and ¼ tsp. of salt. Bring to a boil. Then reduce to a simmer and allow it to cook for about 15 minutes. You want to stir occasionally. 2) While waiting for the lentils to cook, in a pan, heat oil over medium-high heat. Add cumin seeds and cook very quickly for about 30 seconds until fragrant and slightly brown. 3) Then add in the onion and cook for 1 – 2 minutes until onions are golden brown and fragrant. 4) Stir in the rest of the ingredients, garlic, ginger, coriander, cayenne pepper and the remaining ¼ tsp. of salt. Continue to sauté very quickly for another 1 minute. Remove from heat. 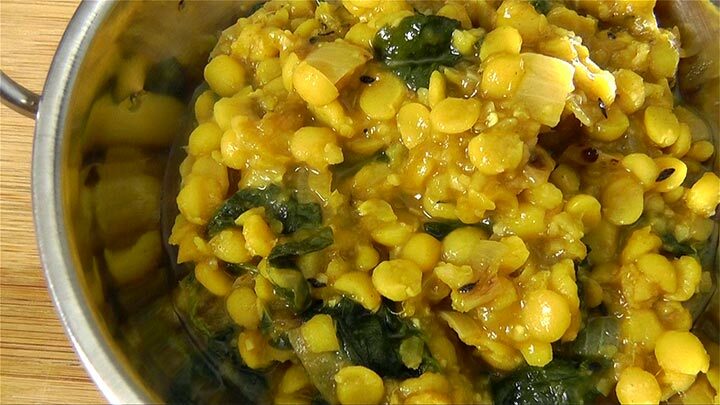 5) Stir the cooked mixture, mango and spinach into the lentils. Allow all the ingredients to simmer for another 15 minutes, until the lentils are falling apart. Keep stirring occasionally. This dish is just bursting with flavours. I love the nutty and earthy flavor of lentils, combined with the sweetness of mango, and the spices really brings this dish together. For a balanced meal, serve it with 1 – 2 chapatti or a cup of basmati rice. Lentils are also a great source of protein for vegetarians. If you have never tried lentils before, it’s time to start adding this superfood into your diet. *Or ¾ cup of diced fresh tomatotoes and ½ cup of water. 1) Heat ½ tbsp. oil over medium-high heat. Add curry powder, garam masala and mustard seeds. Toast for about 30 seconds until the spices begin to darken. 2) Add onion, garlic, ginger and salt. Saute for about 2 to 3 minutes until they are soft and slightly brown. 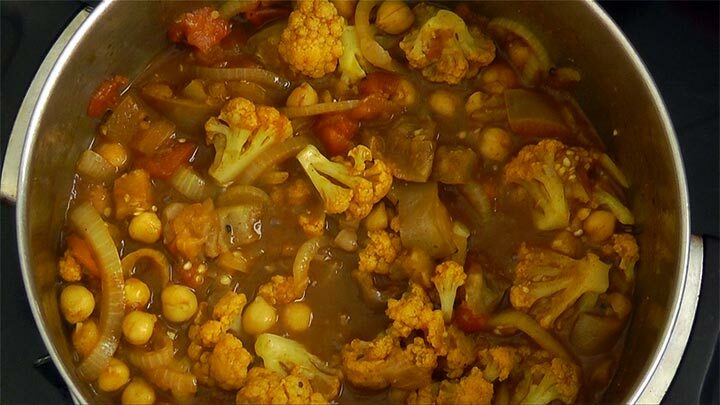 Then stir in the eggplant, cauliflower, chickpeas, tomatoes and water. 3) Reduce to a simmer and cook for 15 to 20 minutes until vegetables are tender. You want to stir occasionally. 4) Remove from heat and serve warm. 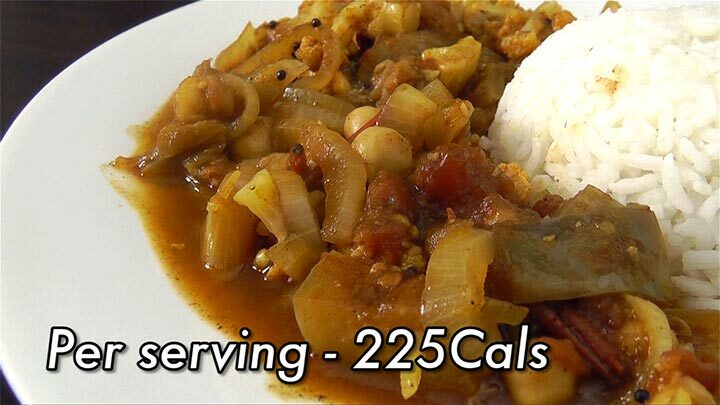 Each serving only has 225Calories. Serve it with ½ cup or 1 cup of Basmati Rice and even a piece of grilled chicken or fish. This makes a really delicious and wholesome meal. All these recipes can be prep ahead, and will keep well in the fridge for up to 3 days or in the freezer for up to 2 weeks. When you want to eat them, just reheat and serve. So make smarter choices, choose healthier cooking methods such as grilling, steaming, baking, broiling or lightly stir-frying. If you are used to eating huge portions, start being aware of your portion size and stay active. 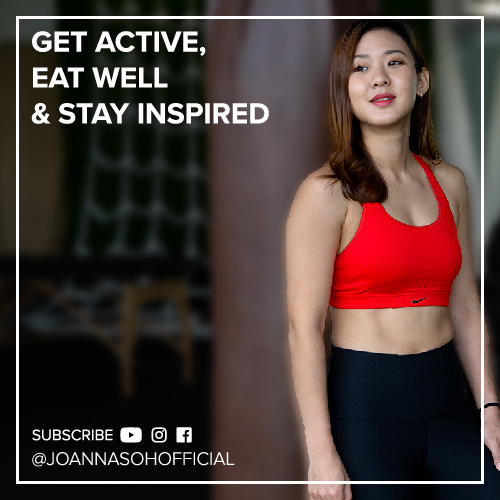 Remember, keep it simple, balanced and moderate. These are few of my favourite healthy Indian meals. To substitute fresh diced tomatoes for a 14.5-ounce can of undrained diced tomatoes, use approximately 1 1/4 cups of diced fresh tomatoes and 1 cup of liquid. If your recipe calls for a 28-ounce can of undrained diced tomatoes, use about 2 1/2 cups of diced fresh tomatoes and 1 cup of liquid. Use any liquid that seems appropriate for your recipe, such as water, broth or tomato juice.